The Latest Conference Board Consumer Confidence Index was released this morning based on data collected through February 10. The 70.4 reading was higher than the consensus estimate of 67.0, reported by Briefing.com and a rise over the January upward revision of 64.8. Here is an excerpt from the Conference Board report. 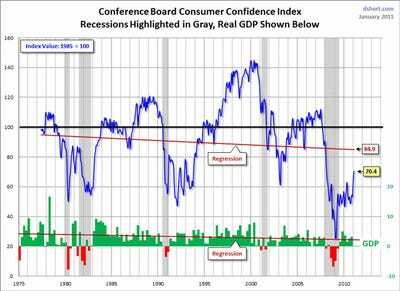 Says Lynn Franco, Director of The Conference Board Consumer Research centre: “The Consumer Confidence Index is now at a three-year high (Feb. 2008, 76.4), due to growing optimism about the short-term future. Consumers’ appraisal of present-day conditions improved moderately in February. Those stating business conditions are “good” increased to 12.4 per cent from 11.3 per cent, while those claiming business conditions are “bad” was unchanged at 39.6 per cent. Consumers’ assessment of the labour market was also more positive than in January. Those saying jobs are “plentiful” rose to 4.9 per cent from 4.6 per cent, while those stating jobs are “hard to get” decreased to 45.7 per cent from 47.0 per cent. Consumers’ short-term outlook was more optimistic than in January. Those expecting business conditions to improve over the next six months increased to 24.4 per cent from 24.0 per cent, while those anticipating business conditions will worsen declined to 10.4 per cent from 12.2 per cent. The More Sobering Historical ContextLet’s take a step back and put Lynn Franco’s interpretation in a larger perspective. 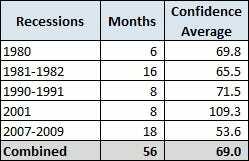 The table here shows the average consumer confidence levels for each of the five recessions during the history of this data series, which dates from June 1977. The latest number is very close to the average confidence level of recessions. The chart below is another attempt to evaluate the historical context for this index as a coincident indicator of the economy. Toward this end I have highlighted recessions and included GDP. The linear regression through the index data shows the long-term trend and highlights the extreme volatility of this indicator. Statisticians may assign little significance to a regression through this sort of data. 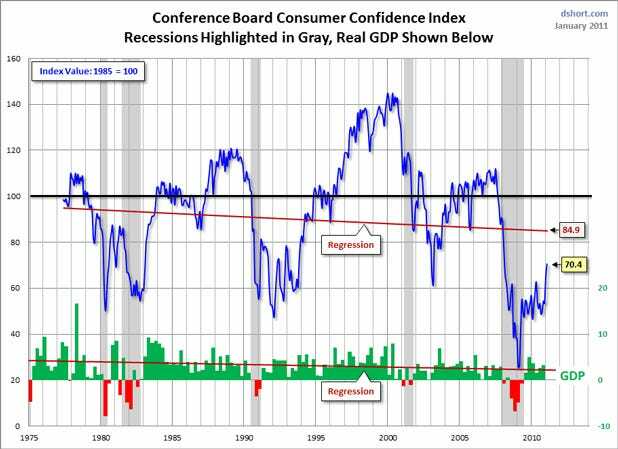 But the slope clearly resembles the regression trend for real GDP shown below, and it is probably a more revealing indicator of relative confidence than the 1985 level of 100 that the Conference Board cites as a point of reference. Today’s reading of 70.4 is significantly below the 84.9 of the current regression level (17.1% below, to be precise). 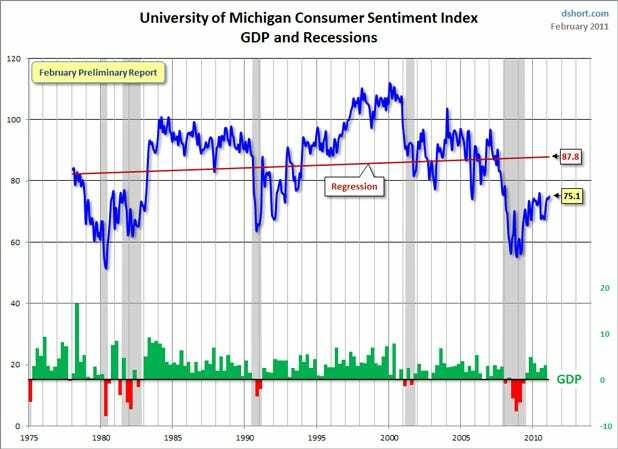 For an interesting comparison, see my post on the most recent Reuters/University of Michigan Consumer Sentiment Index. Here is the chart from that post. And finally, let’s take a look at the correlation between consumer confidence and small business sentiment, the latter by way of the National Federation of Independent Business (NFIB) Small Business Optimism Index. As the chart illustrates, the two have been closely correlated since the onset of the Financial Crisis. 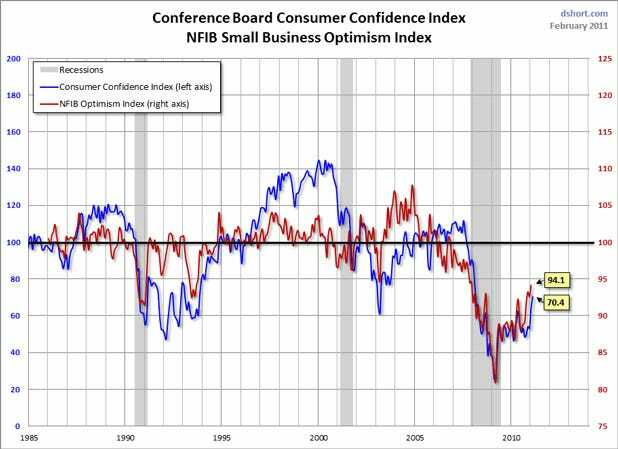 The NFIB index has been less volatile than the Conference Board Consumer Confidence Index, but it has likewise remained bleak despite the official end to the recession in June 2009. This post originally appeared at DShort.com.